Ensure that your branding is in front of the audience in this very popular theatre destination attracting over 3500 visitors at the 2018 show. Ensure your branding is part of the studio's 'logo wall' - and therefore a part of each of the 100 video interviews produced on-site. Ensure your branding is in front of our audience in this popular theatre. This theatre is filmed too, boosting brand presence, impact and longevity. Add your branding to one of CM|IP's populat lounge areas. Open to all CM|IP exhibitors, the CM|IP lounges provide the perfect space to meet, network and relax. 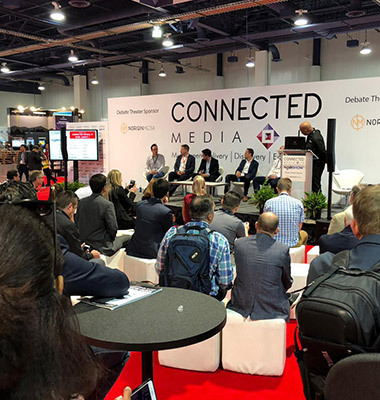 An Associate Sponsor will be entitled to the package outlined below, which is aimed to raise an exhibitor’s profle pre, during and post the 2019 NAB Show. You do not need to be a CM|IP exhibitor to sign up for this package. IBE ‘CEO Series’ video interview in the CM|IP Studio. A presentation in the CM|IP Theatres. The Theatres can seat circa 100 people per session. Join a CM|IP Panel Debate in the CM|IP Debate Theatre. Quarter page of advertising in the CM|IP Show Guide (Printed copies distributed at NAB Show and electronic distribution to BPL Broadcast’s GDPR compliant and finely tuned database). Social Media integration across all BPL platforms. GDPR compliant and finely tuned database). Logo and company description on the www.connectedmedia-ip.com website. In addition to the Connected Media|IP exhibition (which includes turnkey and free-design exhibition space) are the CM|IP Theatre speaking opportunities and the chance to network in the CM|IP Lounge.